Flu season is here- hopefully you’ve been lucky enough to avoid catching something so far but chances are you’ve been around people who were sick. If you’re looking for something besides the flu shot to prevent coming down with a virus this winter, consider regular chiropractic adjustments. Dr. Jess at the Cafe of Life in Longmont provides excellent chiropractic care for the whole family to strengthen the immune system and help prevent the flu. The flu differs from the common cold mainly in that it causes a fever while a cold does not. Other symptoms of the flu are runny nose, congestion, sore throat, cough, muscle and joint aches that usually last around four days. Chiropractic care will increase your natural resistance to viruses by ensuring your body is free of subluxations so that it can function optimally! Maintaining a strong immune system is the best way to prevent catching the flu this season. Get 7-8 hours of sleep every night, and if you’re starting to feel under the weather, try to get even more. Exercise regularly to boost your immune system’s natural killer cells, which help fight viruses. Even when you come down with a virus, it’s better to take a walk than stay on the couch- it will help break up mucus and release endorphins. Eat healthy by loading up on veggies and reducing sugar, and take a vitamin D supplement when not getting enough sun exposure. We can’t avoid being around sick coworkers and our kids can’t avoid sick classmates, so it’s important that everyone’s immune systems are strong to prevent passing a virus around at home. Finding an experienced family chiropractor like Dr. Jess at the Cafe of Life in Longmont is one of the best ways to prevent coming down with the flu! Spinal traction, or spinal decompression, is the stretching the spine using a traction table, with the goal of relieving pressure and gently allowing your spine to return to it’s correct position. This technique has been used by chiropractors, osteopaths, and more for many, many years. A compressed spine can cause pain as well as block the natural flow of nutrients and nerve signals to the entire body. The spine is stretched and relaxed intermittently in a controlled manner, by a skilled and highly trained chiropractor to bring about alignment. No, it shouldn’t hurt. Spinal decompression is a gentle, comfortable procedure that usually takes less than 30 minutes. Many patients find it a relaxing addition to their day and it can easily be done over your lunch break with no disruption to your day. If you’re struggling with nagging pain, or have been diagnosed with a disc condition, it’s likely you could benefit from this type of chiropractic treatment. The best way to find out is to come in and have an initial exam performed by our family chiropractor Dr Jess Thompson. With so many means by which to help you achieve optimal health, she can ensure that the proper technique for your specific needs is used and you’re not just given the any-old-technique-will-do approach. She designs the plan best suited to you! If you’re concerned about the spinal decompression process, she is more than happy to explain in detail all the steps used, what to expect during decompression, and answer any questions to make you feel completely as ease with her chiropractic practice prior to beginning treatment. Any chiropractic session with Dr Jess always starts with the entire person. She strives to understand the complete being in order to provide the appropriate treatment. Her goal is a healthy, happy client. Additional treatments that often accompany spinal traction therapy are ultrasound, laser therapy, cold/hot treatments, lifestyle recommendations, and stretches/exercises to maintain physical health between appointments. It’s that time of year again—candy, candy, and more candy. Oh…and costumes. Café of Life Chiropractic in Longmont wishes everyone a fun, safe, and healthy Halloween! Halloween can be such a fun and exciting holiday for families. But it certainly doesn’t mean you need a candy induced coma. Dr Jessica truly believes in not just spinal health but overall health and wellness and that includes what we choose to take into our bodies–sugar. She is a family chiropractor who cares. Sugar is known for its links to weight gain and tooth decay, but it has also been linked to heart disease, Type 2 diabetes, liver disease, and metabolic disorders. Sugar gets a bad rap because we tend to eat too much of it! Excess sugar can take a serious toll on your health in the long run. But Dr Jessica is also a realist and a mother of some very fun loving boys herself. As a skilled chiropractor and health advocate she suggests a more “livable” solution. Instead of depriving your kids (or yourself!) of all sugar and sweets, try placing limits on consumption. The occasional indulgence is not only acceptable but much more realistic, and even good for the soul. If you establish a healthy lifestyle that combines fresh, nutritious foods, with regular moderate exercise, and spinal adjustments on a regular basis, you will naturally keep your sugar consumption to a minimum. You’ll be prepared for a sugar focused holiday like Halloween and be kind to yourself about your small indulgence and move forward in health. 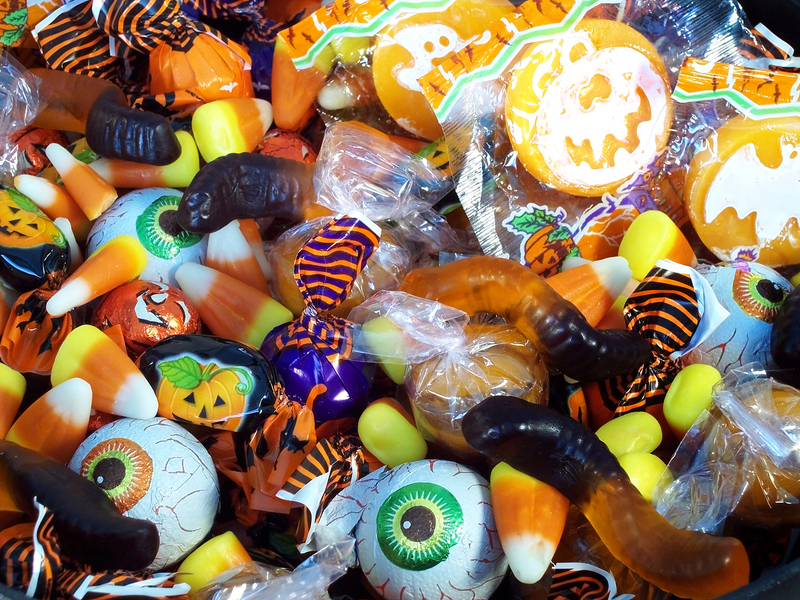 If having loads of candy around makes it difficult, plan ahead to keep only a few small pieces and have the rest donated, exchanged at a candy buy-back, or simply thrown out! Turn the focus to creative costume ideas, holiday games, harvest festivals, pumpkin carving contests, and other non-food related fun! Does Halloween, and the upcoming holiday rush, wreak havoc on your stress levels? Come into Café of Life in Longmont for a chiropractic adjustment or massage to keep you in top physical health through this holiday season. Getting a spinal adjustment and working out tight, sore muscles can lead to decrease stress, better sleep, an increase in energy, and a general feeling of overall health and well-being. Cafe of Life Chiropractic & Massage Studio is Moving! We are adding a BIG benefit to ALL of you! practice together on November 2nd, 2015. YOUR source for health and wellness. Share it with everyone! Everyone needs more of the good stuff and our new space will be filled with the GOOD STUFF – YOU! Cafe of Life Chiropratic & Massage is proud to serve all your family chiropractic and massage needs. Schedule an appointment for our new office today! Anyone can get an ear infection but they are more common in children and they can make for a very unhappy kid. Something so painful and upsetting to both you and your child can be worrisome and frustrating, especially when they become a chronic problem. Ear infections are the number one reason for pediatrician visits—especially in the wintertime when they tend to be more prevalent. The most common treatment is a round of antibiotics, but most will resolve without them. More often, parents are turning to chiropractors to help with their children’s overall health. Today we look at the benefits of using chiropractic care for ear infections. Chiropractic care focuses on the restoration of normal, or optimal, body function. We don’t just treat a symptom, but aim to get to the root of the problem. Our goal is to work with the nervous system by doing gentle spine manipulations to affect the entire function of your body. If you or a family member struggles with chronic ear infections it would be a good idea to consider chiropractic care to help ease symptoms and prevent future infections. A knowledgeable chiropractor knows how all systems of the body—muscular, respiratory, circulatory, digestive, etc.—depend on the proper function of the nervous system. They know how to spot and diagnose. A skilled chiropractor will be able to treat patients of all ages and adjust treatment to accommodate the patient’s needs. You have choices with your healthcare. Dr Jessica Thompson at Café of Life Chiropractic in Longmont specializes in spinal correction and care for the entire family. She especially enjoys treating children as she is a mother to three boys of her own. Children’s chiropractic is actually a conservative and drug-free approach. It is just another modality that can greatly increase you and your family’s health, over all function, and ability to fight infections—including ear infections.